The spectrum of an astronomical object can provide clues as to its composition. Having obtained a spectrum, you then inspect the spectral lines that are present. The positions in the spectrum at which these lines are present allows you to identify their wavelengths and thus you can identify the chemical elements responsible. The strength of the lines will also give an indication as to the relative amounts of each element present. To obtain a spectrum, you merely need to pass the light from the object through a prism or through a diffraction grating. A prism is cheaper, but a diffraction grating will produce a more linear dispersion of the spectrum and thus will make it easier to identify the individual spectral lines. A “spectrometer” is merely the combination of a prism or grating with a camera. For meteor spectra, there is an obvious question. You don’t know where (or when) the meteor is going to appear, so in which direction should you point your camera? As you don’t know where the meteor is going to appear, all that you can do is to follow the same guidelines as are recommended when attempting the imaging of meteors in general. This advice is to point the camera, with its associated prism or diffraction grating at an area of sky about 40 degrees from the meteor shower radiant and at an altitude of about 50 degrees above the horizon. If no meteor shower is active, then you would still point the camera of around 50 degrees altitude but the compass direction to use would probably be based on the darkness of the sky around your observing site. One example of a spectrum is shown in the image to the right. This was captured by Bill Ward on the night of Quadrantid maximum in 2015. The associated meteor (outside of the field of view) will have been moving roughly horizontally relative to the field of view and so the individual spectral lines are aligned parallel to that path. Meteor spectra will typically consist of a number of bright emission lines. 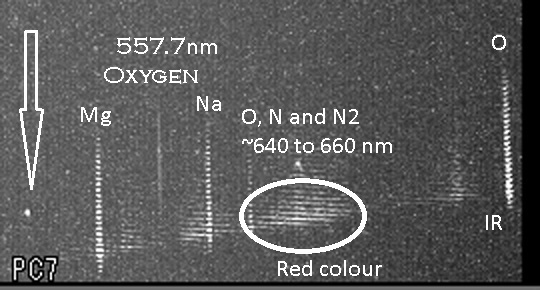 Although spectra sometimes shown an indication of a continuous background spectrum, there is debate as to whether this is a genuine thermal feature or merely the combined result of many low intensity unresolved spectral lines. In the above case, most of the spectrum was captured within the field of view. However, this will not always be the case, as is the case for the Taurid fireball whose spectrum was captured by Bill Ward in October 2014 and is shown in this next image. The bright diagonal line across the bottom right should be ignored as it is merely an image artefact caused by the presence of the moon close to the field of view. 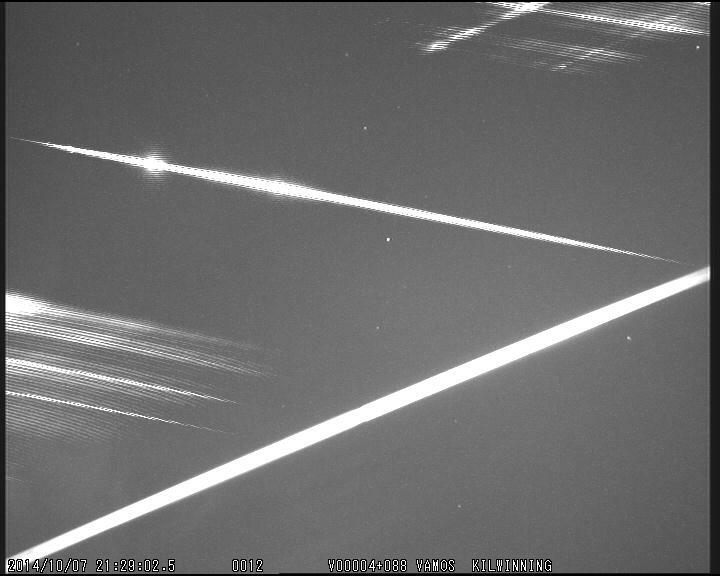 The bright line across the centre of the image is the zero order spectrum, essentially an image of the fireball itself – you can see one bright flare and one broader flare in brightness in the path of the fireball. A diffraction grating produces a first order spectrum to each side of the zero order spectrum. You can see bright patches in these at the times at which the flares appeared in the fireball. But, as can be seen, the big problem is … that large parts of the first order spectra have fallen outside of the camera’s field of view. Capturing meteor spectra always involves a compromise. The more that you disperse the lines, the easier it is to differentiate between lines of different wavelengths. The dispersion from a 600 lines/mm grating will be greater than that from a 300 lines/mm grating. However, increasing the dispersion also makes the spectrum fainter and increases the risk that part or all of the spectrum may fall outside of the camera’s field of view. Bill uses a special blazed grating in which the grooves have been cut so as to direct most of the light into the first order spectrum on one side of the image. Thus that first order spectrum appears brighter and gives a clearer image (the first order spectrum on the other side will consequently be fainter, but Bill considers that the benefit of getting a brighter spectrum 50% of the time makes this risk worthwhile). Having captured the image of the spectrum, the next step is to rotate/flip and crop the image so that the image is horizontal with the blue end of the spectrum to the left. The intensity and positions of the lines are then be measured and they can then linked to those of likely constituent elements. One example, for a Perseid whose spectrum was imaged by Bill in August 2014, is shown to the right. The shorter wavelength (blue) part of the spectrum fell outside of the field of view and this shows the spectrum from the green to the near infrared. There is a bright green emission line from magnesium, along with a yellow emission line from sodium. 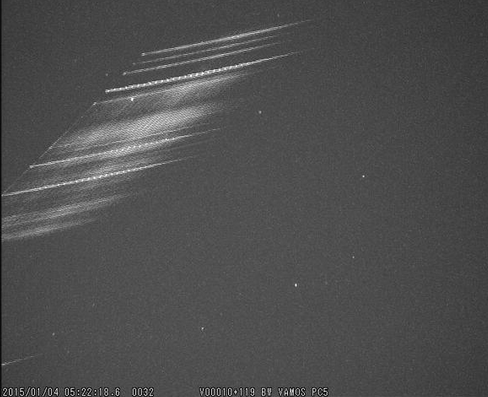 Many meteors also show an emission line in the red from calcium, but this is not clearly seen here. 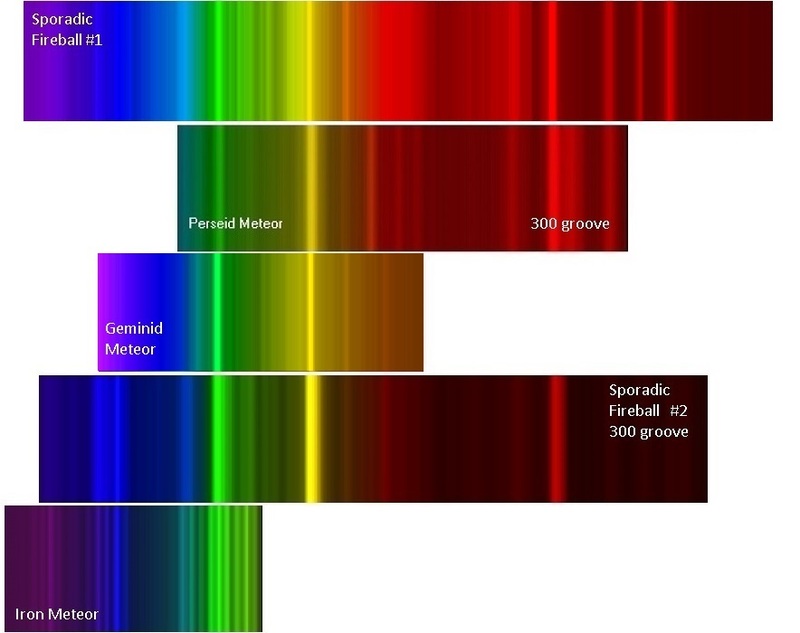 The lines in the infrared are mostly related to the atmospheric gases with which the meteoric particle collided – the presence of these atmospheric lines in all spectra helps calibrate the wavelengths in the remainder of the spectrum. People sometimes express surprise that some bright meteors appear green to the naked eye. This is probably because they don’t see green stars. However, whereas stars emit a continuous spectrum of light, the sum of which adds up to being close to white, meteors only emit light at specific wavelengths and thus if the spectrum is dominated by a strong green emission line from magnesium, this can cause the meteor show a strong green colour. “For processing the meteor spectrum image is re-oriented to be horizontal and the meteor trail is aligned vertically using a graphics package (IRIS). It would be nice to think that we could determine the composition of distant comets by inspecting the spectra of their associated meteor showers. In practice, of course, much of the volatile material from the comet will have been lost during the process that ejected the meteoric particles. However, do differences in spectra between meteor showers give clues as to differences in the non-volatile composition of their parent comets? The answer is unclear. Although a number of articles have been written about the interpretation of meteor spectra, it is often not clear as to whether the statements included are based on theory, based on a general inspection of meteor spectra, or are based on detailed analyses of the spectra. This leaves us with a number of factors, listed below, that may affect the relative strengths of the different emission lines seen in the spectra and it is not immediately clear as to which are the most significant. The above factors are not all independent of each other – faster, larger particles are likely to reach lower altitudes than are slower small particles. These colourised versions were generated by taking the intensity measurements collected and using the VSpec software to produce a colourised version of the spectrum. How much do spectra differ between meteor showers? From spectra captured during 2014, Bill Ward was able to compare the Perseids and Geminids,with three non-shower meteors. 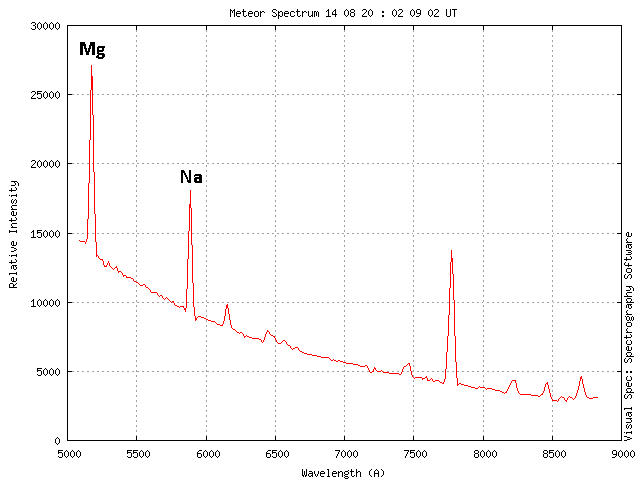 As can be seen the relative strengths of the green (magnesium), yellow (sodium) and red (calcium) emission lines varies between the first four spectra. The first and last spectra are from sporadic meteors. Whereas meteor showers are mostly related to (“icy”) comets (the Geminids being an exception), sporadic meteors are sometimes related to defunct meteor showers and sometimes asteroidal (“rocky”) in origin. How much does the spectrum vary between meteors within a given meteor shower? This can be tricky to answer as it requires the capture of a good number of quality spectra … and there is always the risk that the data may be “contaminated” by a sporadic meteor whose path just happened to line up with the shower’s radiant. 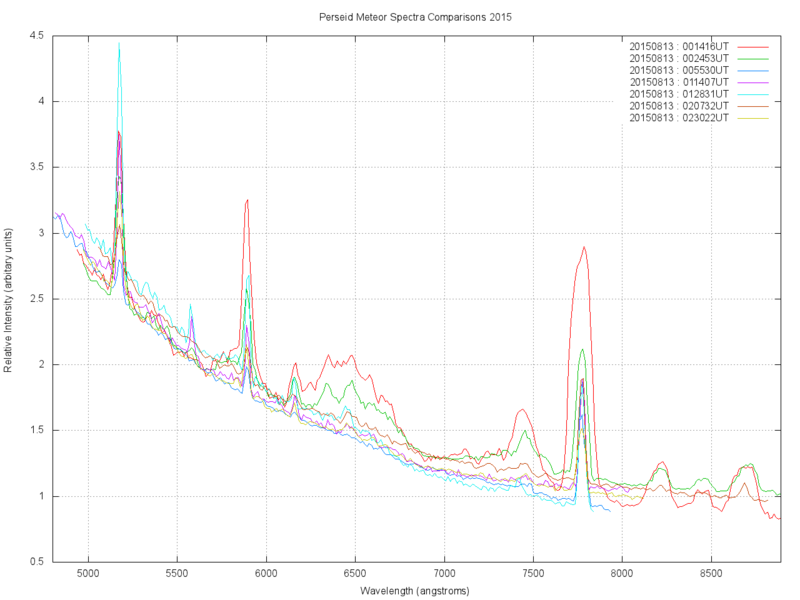 However, the accompanying intensity plot compares the spectra of seven bright Perseid captured by Bill at Perseid maximum in 2015 and it does suggest strong similarities. The two bright emission lines to the left are related to magnesium and sodium. The broader band near the centre is related to oxygen and nitrogen. The bright emission line to the right is due to oxygen and is actually located in the near infrared rather than in the visible spectrum. How much does the spectrum change during the passage of a meteor? 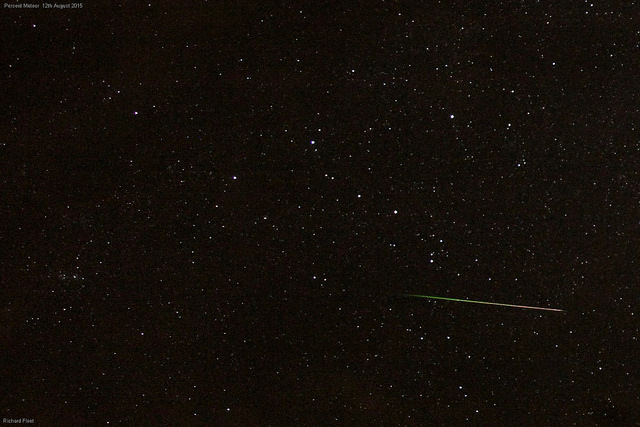 DSLR images of Perseids, such as the one shown here that was captured by Richard Fleet, often appear green at the start, whiter in the middle and red at the end. This effect is not seen in most other meteor showers however. The reason that Perseids are different is that they are fast meteors (about 62km/s) and so carry more kinetic energy and therefore are likely to start emitting light at higher altitudes than do most other showers. The colour changes can be understood by measuring that relative intensities of the emission lines at each of the stages. This accompanying spectrum by Bill Ward (for a different Perseid) shows how the intensities of various emission lines changed during the passage (from top to bottom) of the meteor. The oxygen line to the far right is in the infrared and can be ignored as it doesn’t affect the visible spectrum. Note that the first line to appear in the visible spectrum is the green 557.7nm line from oxygen. This emission line can only be produced at high altitudes (above 110km). Hence the trail in the DSLR image is initially green. Soon afterwards, more intense emission lines from magnesium and sodium appear and these swamp the oxygen line (while still above 110km). The combination of the yellow Na and green Mg produce a whiter colour. Finally, if the particle is large enough to survive lower into the atmosphere, the broad red band from oxygen and nitrogen can dominate, causing the end of the meteor to appear reddish. Note however, that the colours seen with the naked eye may be different as the eye is only sensitive to colour above certain intensities. Hence the initial green colour will usually not be visible to the naked eye. Historically, the vast majority of spectra captured were from the Perseid and Geminid meteor showers – largely because people concentrated their imaging at the times when the chances of capturing a spectrum were higher. In pre-digital days, observers were reluctant to devote large amounts of photographic film and associated film developing time when capture rates were likely to be very low. In recent years, however, Bill and others are increasing our knowledge by expanding the imaging to other times of the year and thus capturing spectra of meteors from other showers, such as the Taurids and the Quadrantids, and by capturing spectra of a variety of sporadic meteors.